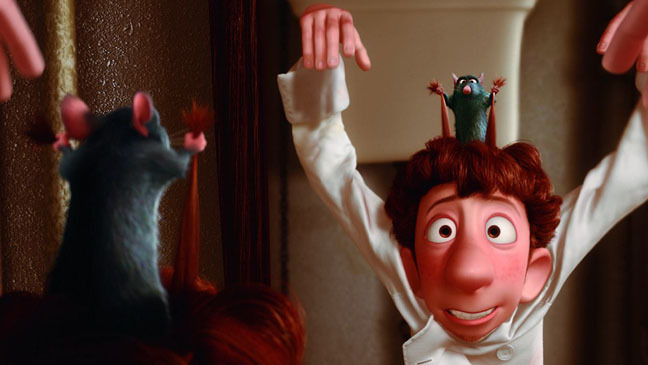 Ratatouille: So, Do You Want Rats in your Kitchen? Pixar was at its peak, and decided to go for a high concept film about... rats. It didn't make sense, but once you saw the film, suddenly it did. 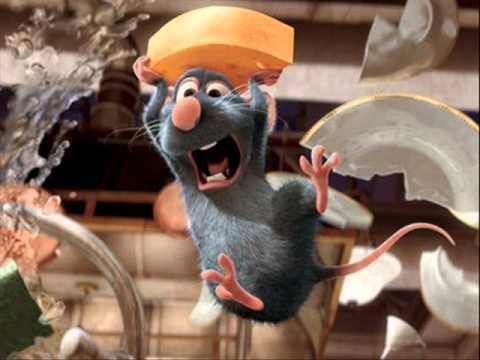 "Ratatouille" (2007), directed and written by Brad Bird and Jan Pinkava, proves that a one-joke idea can be stretched out into one of the top animated films of all time. 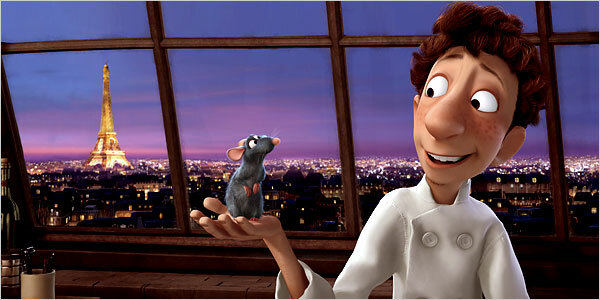 Remy (Patton Oswalt) is a Parisian rat who has high aspirations: he intends to become a top French Chef. His family tries to dissuade him, but he perseveres. 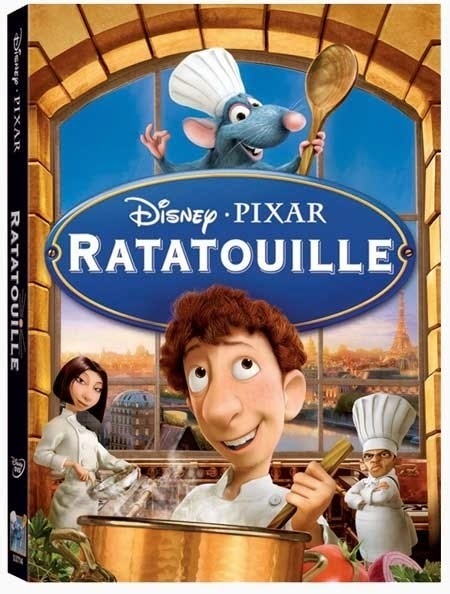 Living in the sewers of Paris, he finds his way to a restaurant once run by his idol, Auguste Gusteau (Brad Garrett). Given a chance to prepare some soup due to an accident, Remy accomplishes that feat to perfection. The person who created the opportunity, Linguini (Lou Romano), takes the credit and is accepted as a competent chef. Linguini, realizing that his success is due to Remy, takes the rat home with him. Linguini turns out to be the rightful heir to the restaurant, and Remy helps him to establish his claim and remove the current owner, Skinner (Ian Holm). Linguini settles in and starts up a romance with one of the chefs, Colette (Janeane Garofalo). Skinner, however, discovers Remy's skills and kidnaps him to help his career. Remy is freed by his father, Django (Brian Dennehy), and then must return and help Linguini prepare a meal for a famous food critic, Anton Ego (Peter O'Toole), whose decision about the restaurant's quality will make or break the restaurant. There are absolutely gorgeous colors in this computer-animated film. The moral of the story, though, is the real pay-off, as Remy learns to find his place in a tough and unforgiving alien world. It also is a standard Pixar comedy-with-heart, as the good guys are easily identifiable and must triumph despite the usual trials and tribulations. If there is a typical criticism of this film, it is that the main voice actors are inexperienced. Lou Romano and Ian Holm never seem to get their characters completely down, and the character of Linguini is sometimes a mystery. Why does this not make me want to go into a restaurant to eat? However, the quality of the animation is superb. Pixar is terrific at getting things to look real but not too real, so as to retain the air of animation without becoming too cartoonish. Fluids and Remy's fur flow in realistic patterns that are truly amazing. Michael Giacchino's score evokes the sounds of Paris, creating a unique ambience not found in other animated films. 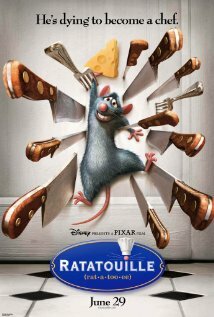 "Ratatouille" has a bit of fun poking away at French cooking pretensions, but it never does so in a mean way. It won the Oscar for best animated film and was nominated in several other categories. In the end, it is a satisfying meal with enough adult humor to satisfy most people, while the adorable rats and sight gags will keep children amused.